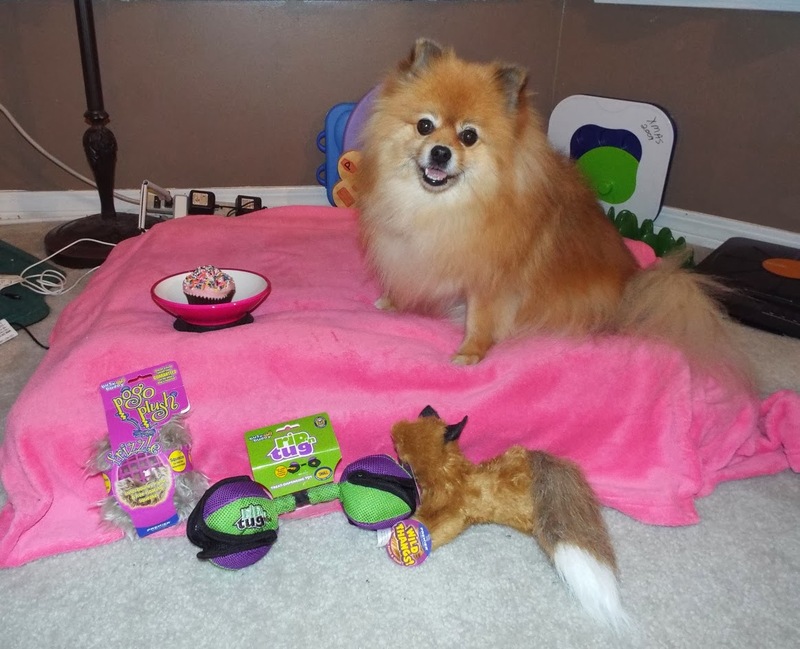 It's time to pawty with my birthday presents from PetSafe! Don't you love barkdays (birthdays)? I think barkdays are furrific! I get presents and treats! This year my pals at PetSafe gave me some pawsome presents! I need to get this paper open to see what my present is! It's a Busy Buddy Pogo Plush Frizzle! Pogo Plush toys have a bouncy rubber frame inside instead of stuffing. The squeaker floats around inside the cage, so you never know what part to bite to make it squeak. The Frizzle is lots of fun! I am determined to find that squeaker! The Frizzle is available in 2 sizes, small & large. The small one is the pawfect size for me. Guess what a Frizzle looks like: Tribble Pepper! BOL! I resemble this toy too! It's a Wild Thangs Fox! He squeaks! This is so much fun! A note for the humans: Wild Thangs! toys have reinforced seams and puncture resistant squeakers. Oh yummy! A Busy Buddy Rip 'n Tug Barbell! Your human puts treats inside the ends, and velcros them closed. Then you get to rip open the velcro and eat the treats! Fun! The Rip 'n Tug Barbell is available in 3 sizes: small, medium, & large. The small is size is just right for my Pommie mouth and paws to play with. This a great toy for dogs who like to "open" their toys to "see" what's inside. BOL! It can be opened over and over again! PetSafe didn't forget my kitty pals. PetSafe makes pawsome Frolicat toys for cats. Check out my video to see how fun the Frolicat Twitch toy is! Your human attaches it a smooth surface with the suction cup on the base, then presses the button. It sings like a bird and jumps around. Tell your humans the bird noise in only at the start, so it won't disturb them. BOL! It uses 3 AAA batteries. It has 2 modes: single 10 minute play session, or multiple play sessions throughout the day without needing to re-press the button. If you pull all of the feathers out, PetSafe sells replacement "birds" (teasers). BOL!! I was able to pull the unit off the table, but I am dog that can pull a 10 pound purse across a room. Thank you PetSafe for the pawsome barkday presents! I love all of them. Time to eat my Barkday pupcake from 3 Dogs & a Chick! Yummy! PetSafe wants to share the Barkday fun. PetSafe will send one Pepper's Paws dog fan 3 toys just like the ones they gave me. They will also send a Frolicat Twitch to one Pepper's Paws cat fan. High Paws!! Giveaway Disclosure: I did not receive any monetary compensation for this giveaway. PetSafe will ship the prize directly to the winner. I am not responsible for lost/missing prizes. The opinions in this giveaway are my own and not influenced by any outsider . I receive no additional benefits for talking about the product or company. The Pogo Plush Looks Cool! My Dogs Do Open Their Own Gifts, I Entering For The Dog Prize. Hope you saved me a piece of that PupCake! You're having a PAWSOME birthday, Pepper! I entered your contest. You have a super wonderpurr birthday! Happy Birthday Pepper! Those toys look super fun! Shiner just had her birthday last week. 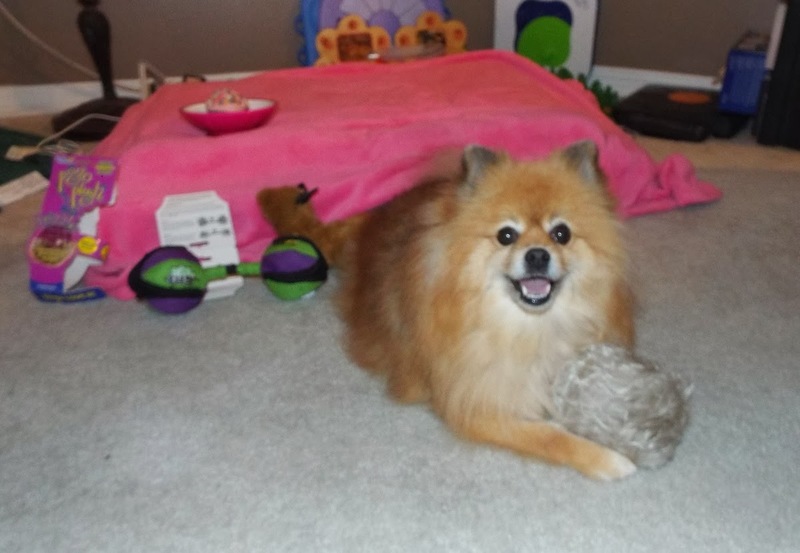 She had a PetSafe toy before and she enjoyed shredding it :) Your cupcake looks delicious! I think I want a bite too! Happy Birthday! We used to have a Twist 'n Treat that Mr. N liked. We're interested in the dog prize. Happy Birthday! We used to have a Twist 'n Treat that Mr. N liked. We're entering for the dog prize. Happy Birthday Pepper. You sure did get lots of neat toys! Happy birthday! My dogs would love their Wild Thangs Fox. I have five Treeing Walker Coonhounds and three cats, and while they all love toys, the cats actually have more (and don't ruin theirs the way the dogs do) and the cat tree I ordered for them just came in today, so I think I'll go for the dog toys. I like the Frolicat Twitch, my pets open their own gifts and I entering for the cat prize! Thanks Pepper. Happy Barkday, Pepper! 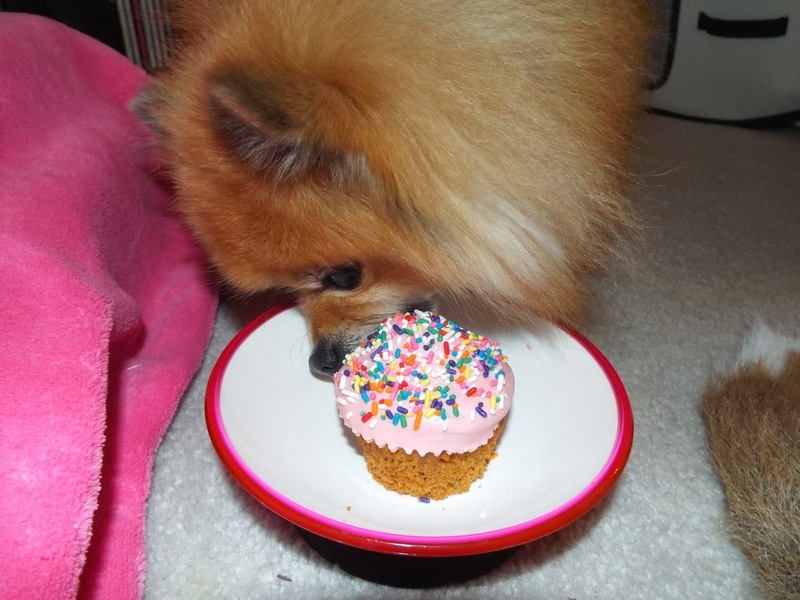 That pupcake looks especially scrumdiddlyumptious! May you have many, many more such happy occasions! Happy Birthday! You sure got some great stuff there and the cake looks mighty tasty! Toughteddybear from twitter. Happy Birthday sweet Pepper. The toys look way fun. Happy Barkday!! Between the toys and that am-a-zing looking cupcake, it looks like you had a great one! Entering to win puppy toys - all for me, no sharing with cats - I can't open my own gifts like you, I just make a big mess! Happy Birthday!!! I want the doggie fun fun toy!!! Ooh,I like to play and having new toys is just what a little Boston boy needs. Thanks and hope you have the bestest birthday evers!!! Happy Birthday! Either - we just got a new kitten and the dogs love him.We love squeeky toys! Happy Birthday! I am entering for the cat prize! And your Pupcake looks mighty delish! Wows, I wish I could gets somethin' that FABulous on my next Barkday!! Happy birfday Pepper Pom! Dese look like great toys. I love getting toys outta bags but I'm not too good wif wrapping paper. heehee. I would love to enter for dat kitteh toy! Fanks pal! Happy Barkday, Pepper! The head peep says it was pawesome meeting you at Global Pet Expo. HAPPY BARKDAY! That looks like a great cupcake. The cats don't share, and they make me open gifts for them. Happy Birthday Pepper from Artie. I open my own gifts and we are entering for the dog prize. The Wild Thangs Fox would be my favorite toy, I love anything that squeaks. I am entering for the Cat Toy. My cat opens his own toys, he is very adept at that! The Busy Buddy Pogo Plush Frizzle is pretty cool -- my friend's dog has one of those! Happy Birthday! My favorite PetSafe toy is the Busy Buddy Twist 'n Treat. It does really keep my dog busy and she loves it. Happy birthday my fluffy gal! I remember and LOVE the tribble picture lol. Dog toys for tulip! HAPPY BIRFADAYS! 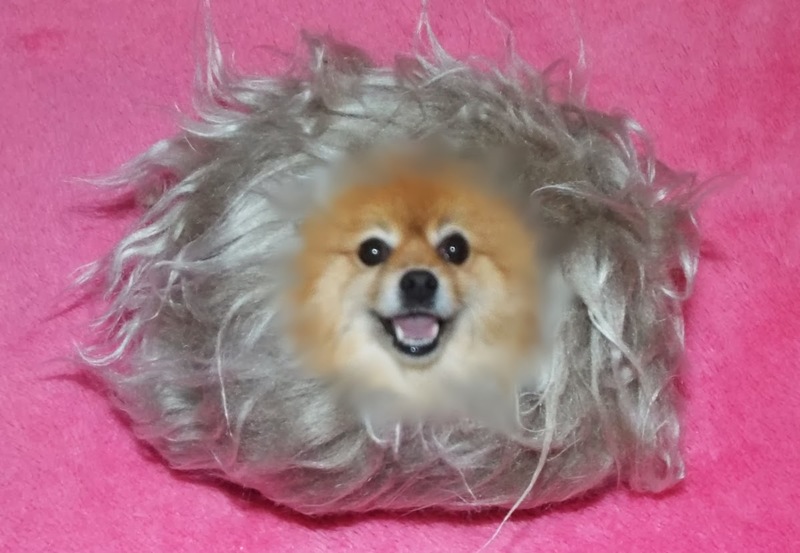 Dem tribbles looks pawsum (n u makes a pawsum tribble too). Hope u n all ur tribbles come by and cause sum trubbles at SCIFIpawty! Lucky dog! I'm entering for the dog giveaway. Lucky dog with all those toys! I'm entering for the dog prize!